Following the sad and unexpected passing of the mathematician John Nash this month, we thought it a fitting tribute to summarise for our readers some of the key concepts involved in his work. Nash equilibria are part of game theory, which explores how actors in a system behave (or should behave) given a set of possible actions and related eventualities. Within this context, a Nash equilibrium is a situation where neither participant in the system has an incentive to change their behavior on their own. This isn’t to say that there is not a better outcome for either of them, but if one player changes course without the other doing the same, that outcome will not be realized. Cooperation is therefore required to improve upon a Nash equilibrium. Not all systems have Nash equilibria. An example of this is in binary situations, where for one player to win the other must lose (e.g. between a striker and a goalkeeper in a penalty shoot-out). Where there is one Nash equilibrium, there may be multiple equilibria – it all depends on whether there is an incentive to change one’s behavior given the current situation. In the scenario above, Player A’s choices result in the rewards on the left of the comma; Player B’s rewards appear on the right. The Nash equilibrium in this case is for both players to take the second option reflected by the highlighted cell, as each stands to benefit if their competitor chooses the first option (even if this option has the highest overall reward). If a player is left on Option 1 after the other deviates to Option 2, then the increase in reward from 4 to 5 makes it worthwhile to also move to Option 2. Easily the most well-known of game theory concepts, the prisoners’ dilemma has no Nash equilibrium. Although there is one situation in which the joint payoff is maximized if both players stay quiet, each is incentivized to cooperate by the prospect of a better outcome if they testify against the other. 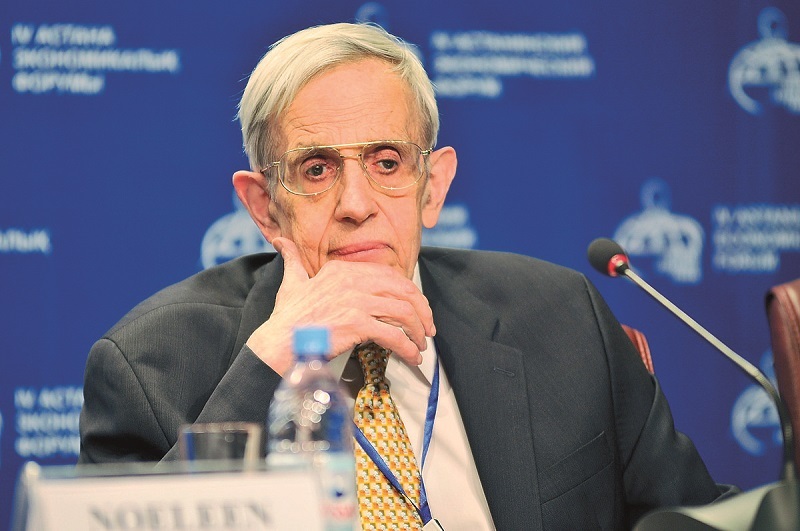 A Nash equilibrium is therefore not simply a mutually beneficial outcome; instead, it is a position from which each player will reach a less desirable outcome by choosing differently. Game theory is a broad and fascinating field that can help businesses to craft strategy and think competitively. By knowing how your actions will affect your competitors’ decisions, you can play out scenarios to find the optimum course of action for your business. John Nash was an important contributor to game theory and mathematics more widely, and his memory will love on through his work. We hope that these simple concepts will inspire you to explore game theory more deeply and to think more about how your business interacts with clients, suppliers and competitors. Please contact us at or call us at +65 6735 0120 to get to know about our global corporate services. “John Forbes Nash, Jr.” by Economicforum – Own work. Licensed under CC BY-SA 3.0 via Wikimedia Commons.